It's time to check in with one of the most amazing women on the planet, Kim Screen of GOOD STOCK. I love telling stories with photographs. And I love creating custom heirloom books at GOOD STOCK, that are the end product of those photographic stories. Last year Kim graciously agreed to do a Friday From The Collectors on Shades where she discussed telling stories with photographs. She has been busy this last year producing "my sweet baby girl, born April 26. Her name is Ruth Mary, named for my grandmother. We’re calling her Ruthie. To say I’m in love is quite an understatement." Kim's back to work designing books, and her recent projects are amazing. 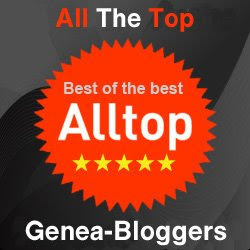 If you are writing your family history, visit Kim's GOOD STOCK blog for massive amounts of inspiration. I am captivated by one of the most recent, her alaskan gold rush book. 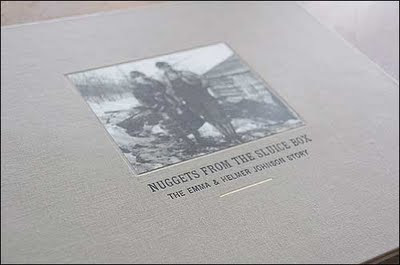 They named their book “Nuggets from the Sluice Box” - a sluice box is a gold mining apparatus. And the nuggets, in this case, are the incredible stories of their grandparent’s lives in the remote Alaskan wilderness. I would love to see this book in person, touch it, read it. Wonderful use of old photographs! 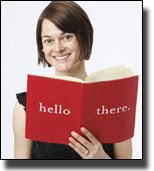 And while you're at the GOOD STOCK blog take a look at the rest of her recent work. Congratulations on the beautiful Ruthie, Kim, I think there's a book there.